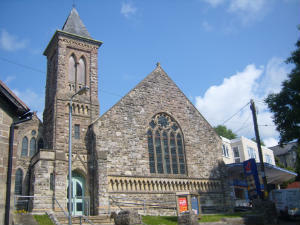 The present Methodist Church is situated in the middle of the High Street. It has a good-sized worship area in the main church seating 120. A large hall adjoins the main church, and a vestry and kitchen are housed in an extension to the rear. Our extensive building upgrade and modernization program is now complete. Tisbury is a large thriving village in rural south-west Wiltshire, situated 10 miles north-east of Shaftesbury, in the newly formed Yeovil and Blackmore Vale Methodist Circuit. There are good road and rail links. The A30 and A303 trunk roads pass close by while the railway station is on the main Waterloo to Exeter line. These, together with its picturesque setting, have contributed to its considerable expansion in the past twenty years. The village has a busy High Street with a good selection of shops and benefits from good public services as well as a state primary school. The many thriving clubs and societies help to foster an excellent sense of community in the village.